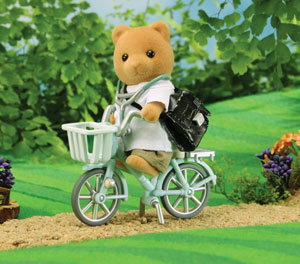 Doctor Murdoch Junior, like his father, shows extra special patience with his patients but unlike his father he only manages to do this because he’s got a bicycle! This means that he can "whizz" off to his next appointmentat speed, taking extra care not to run anyone over! He’s often seen pedalling around Sylvania, visiting patients at home, dashing to his surgery or trying to get to the General Hospital in time for his rounds!